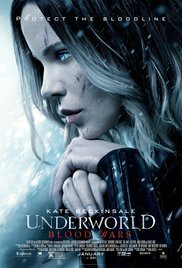 The fifth installment in the Underworld franchise has arrived. One thing that makes me excited about these movies is that they pit werewolves, or "Lycans," as they are called in this franchise, against Vampires. These are not your shiny "fan-girl" vampires either. They are really scary. One such vampire is Selene played by the lovely, and my celebrity crush, Kate Beckinsale. She, once again, provides great entertainment value. She is the signature face of this franchise and is one of the most powerful vampires. In previous installments the Lycans and vampires have gone after her to get her blood so that they also may achieve such power. But this time around, the Lycans are after her daughter, but Selene has no idea where her daughter is. The Lycans don't believe her so she must run away and seek safety. By some luck, she comes to a coven that asks for her help to train young vampires in exchange for keeping her safe. She agrees with these terms because of the encouragement of her friend David (Theo James). Without spoiling anything else, Selene and David eventually get back on the run from both vampires and Lycans alike and have to fight for their lives. Fans of this franchise will get an answer to a very important question: the whereabouts of Micheal. If you are unfamiliar, Micheal was in the first and second films of this franchise and is considered the "Hybrid" because he is a vampire and Lycan combination. The last film didn't clarify his whereabouts, and I was left disappointed, but this film gave me the answer I was looking for. I'll let you find out for yourself where he is. The only problem I had with this flick was its length. It was only an hour and a half, and they could easily have made it longer to fit in more story elements. Some of the scenes felt rushed to me and that hurt the film. But I liked the story and was really happy my question on Michael was answered. I enjoyed this film and if you are a fan of the series you will enjoy it too.